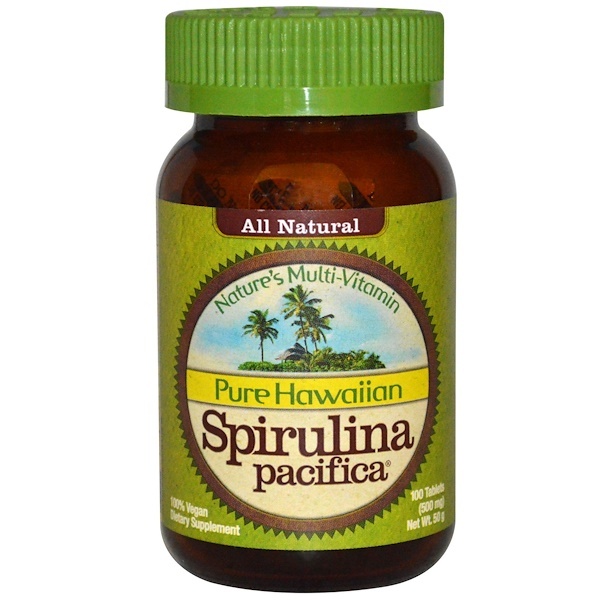 Pure Hawaiian Spirulina Pacifica is packed with nutrients and promotes a variety of health benefits: boosts energy, supports cardiovascular health, supports eye & brain health and boosts immunity. Hawaiian Spirulina Pacifica is the only Spirulina grown with deep sea water providing essential trace minerals & elements. Our patented Ocean Chill Drying technology to ensures maximum nutrient levels. Grown in a Biosecure Zone, our Spirulina is free of pesticides, herbicides, gluten and lactose. Non-GMO Project Verified. Ideal for vegans. 6 tablets daily with or between meals. Refrigerate after opening to maximize freshness. Silica, chicory inulin, vegetable magnesium stearate, contains antioxidant enzyme superoxide dismutase from Arthrospira platensis. Accidental overdose of iron containing products is the leading cause of fatal poisoning of children under 6. Keep this product out of reach of children. In case of accidental overdose, call me a doctor or poison control center immediately. Do not use if seal is broken or torn.